…Because the people who are crazy enough to think that they can change the world, are the ones who do. In recent years, a shift has occurred in the way organizations are formed in response to social problems. More than ever before, the lines between the nonprofit and for-profit worlds are blurred. The for-profit space is considering how it can give back to society, and entrepreneurs are starting mission-driven companies and enterprises. As more and more social entrepreneurs successfully launch their startup business models, it has become increasingly clear that individuals with business backgrounds and skill sets have the know-how to not only get a social impact idea off the ground, but to scale it. In the same vein, social entrepreneurs take on the same challenges as traditional entrepreneurs. They must create a feasible business plan, form a team, find investors, and build a brand. With the same to-do list, it would be odd to imagine they didn’t require the same skills and resources used by for-profit entrepreneurs. But just as one does not simply walk into Modor, one does not simply wake up with the necessary skills to launch a social impact organization—which is where formal social entrepreneurship programs step in. To help you determine whether a social entrepreneurship education is a worthy investment of your time, this piece will discuss whether or not entrepreneurship can be taught, the key characteristics embodied by entrepreneurs, what current programs typically involve, and how academia might play a role in the years to come. The idea of whether entrepreneurship can be taught at all is a highly debated topic. 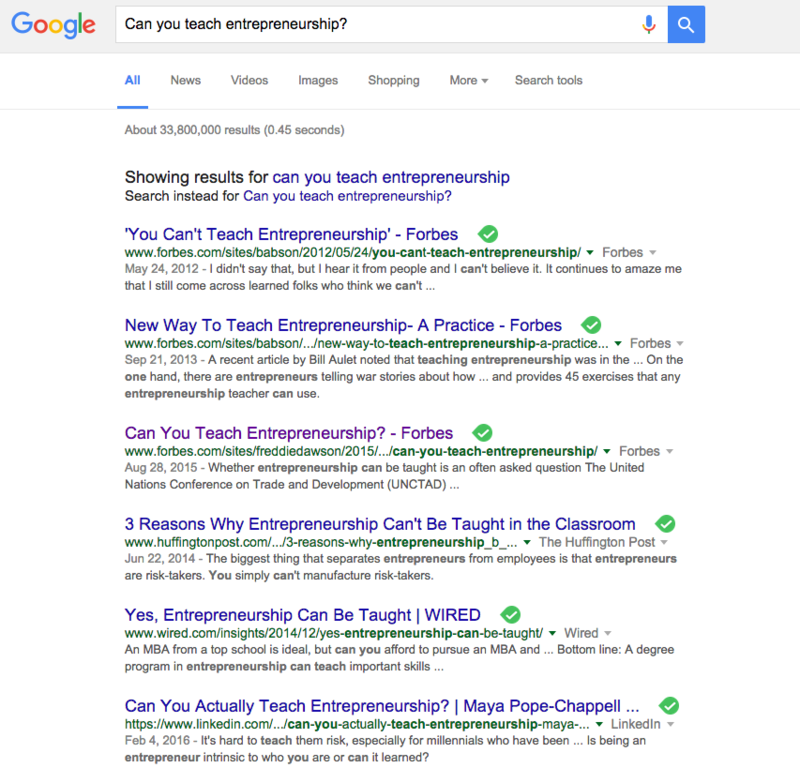 A simple Google search for, “can you teach entrepreneurship?” produces quite the mixed bag. Some argue you can’t just teach someone the inherent qualities that entrepreneurs need to be successful, such as being determined, adaptable, and risk-tolerant. Others suggest that in the time it takes a student to complete a degree in entrepreneurship, the material has already become obsolete. With best practices and available resources changing at record speed, this is certainly an interesting point to consider. However, many claim that you can train individuals to build the skills and mindset needed to launch and execute a successful business idea. If we look simply to the number of courses currently being offered at universities, the answer to “can entrepreneurship be taught?” seems to be a resounding “yes.” In 1985, there were around 250 courses in entrepreneurship on campus. In 2008, there were more than 5,000 classes available, exposing 400,000 to the subject a year. It’s evident students today are exposed to more opportunities to learn about entrepreneurship than any before. If nothing else, the increased number of classes demonstrates a growing demand for this subject, which implies that an increasing number of people are searching for information to better equip them in this arena. Several top institutes now teach social entrepreneurship in some facet within their undergraduate and graduate programs. Whether you believe entrepreneurs are born or made, the reality is that courses are being designed and taught to support individuals trying to realize ideas for the good of the world. If you’ve started a business venture of some fashion, you can be considered an entrepreneur. A successful entrepreneur, on the other hand, tends to exhibit certain traits. Gallup found that those who exhibited these behaviors were 22 percent more successful than others in their study. Their research suggests that people with pre-existing entrepreneurship potential tend to out perform those with less innate abilities, but that steps can be taken to grow these skills. You might self-identify as an entrepreneurial spirit if you feel like you exhibit several, if not all, of these traits. But beyond these personal qualities, and whether or not you’ve started a project, you might also consider yourself an entrepreneur if you study the subject academically. Entrepreneurship classes within the study of business have certainly increased in number and popularity within the last few decades, but we’re also seeing an increase in the availability of social entrepreneurship classes. In addition to this standard education, many schools offer the opportunity to delve into a focus area such as real estate, health care, or you guessed it–social entrepreneurship. This budding area seeks to provide students with the lens to attack a social problem through business know-how. For example, Babson College offers several courses within their entrepreneurship concentration that would appeal to a socially-minded/driven student. At Babson, you can complete a course in Crowdfunding, Social Entrepreneurship by Design, or Culture, Society, and Entrepreneurship in Developing Economies. While universities across the country are offering a larger number of concentrations and classes, four- and two-year degrees are not the only opportunities to complete an education in social entrepreneurship. In fact, many opt for the hands-on, focused approaches provided in incubators, growth accelerators, and online courses. Today, you can become a student from any walk of life, at any point in your life. You have greater access to information than ever before—the information you might need to power your idea or organization. Though some may argue that a true entrepreneur wouldn’t need to attend school to learn how to “make it,” part of being an entrepreneur involves identifying available resources and opportunity in order to achieve a goal. A social entrepreneurship education provides considerable resources. Not only does it instruct you on how to create a business plan, but it also provides an invaluable network of potential partners and mentors. The information, tools, and connections garnered through a social entrepreneurship program can position you and your idea to change the world and make sustainable, life-changing impact. In order to best equip individuals championing this morphing industry, academic programs will need to continue to evolve and develop their programs and the way entrepreneurship is taught. The next step for social entrepreneurship education will likely involve a move beyond discussions of industry standards and best practices to also include entrepreneurial mindset teaching. According to an article by Scott Sherman in the Stanford Social Innovation Review, the Transformative Action Institute offers a curriculum that teaches students seven core competencies (optimism, leadership, creativity and innovation, grit, resilience, empathy, and emotional and social intelligence) that they believe individuals can actually practice in an academic setting. The more universities, and additional programs like incubators, can continue to support entrepreneurs by pushing the boundaries of social entrepreneurship education, the better chance people will have to really bring their ideas to life and effect change.